Tom Hoenig, president of the Federal Reserve Bank of Kansas City and a skeptic on loose monetary policy and the state of the world’s biggest banks, is convinced the United States still hasn’t heeded the lessons of the last financial crisis. During an otherwise happy gathering in our hometown, the “CFO of the Year” awards event organized by the Kansas City Business Journal, Hoenig climbed on his soapbox to warn of the prospect of another crisis in the future. The trouble is, he said, the same too-big-to-fail banks that starred in the 2008 meltdown and the recent HBO dramatization of Andrew Ross Sorkin’s book Too Big to Fail are still, well, too big to fail – even moreso. The financial reform law enacted in 2010 to guard against the next crisis doesn’t solve the issue of systemic risk, Hoenig said. And the world’s central banks continue to be “held hostage” by issues raised in 2008, he said. Exhibit A is the way everyone is worrying that debt problems of one smallish country could reverberate through big banks worldwide – roiling capital markets and threatening a new crisis. Enhances supervision. “We’ve enhanced supervision after every crisis,” and it hasn’t prevented the next cycle of financial collapses, Hoenig noted. Raises capital standards. But commercial banks used to hold capital around 15% of assets, and now some bankers feel 8% is too onerous a requirement, he said. Mandates a new resolution process. But the next time a giant bank teeters on the brink, the bailout impulse will be as strong as ever, Hoenig said. What Dodd-Frank leaves undone is addressing “too big to fail,” Hoenig said. 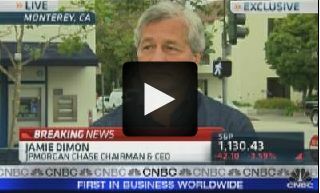 The U.S. banking system is more concentrated than ever, and that fact haunts the financial markets, he said. Hoenig offered a “TBTF” history lesson: In 1913, when the Federal Reserve was created, the five largest U.S. financial institutions managed assets totaling 2½% of the country’s GDP. In the Great Depression, the government created a safety net for banks – FDIC insurance and the like – and barred bank holding companies from speculative activities through the Glass-Steagall Act of 1933. And it worked, Hoenig said. Banks lent money and cushioned their balance sheets against downturns. Investment banks, kept separate from the safety net, took on leverage and invested in riskier assets for greater returns. The economy grew. Markets did well. While the banks expanded, by 1980 the five biggest still held assets equal to only 14% of GDP. One failure wouldn’t have crashed the system. That changed after the 1999 repeal of Glass-Steagall freed banks to enter other financial services, growing bigger and bigger – and taking on more and more risk. Despite the turmoil of 2007 to 2010, Hoenig said, the banks kept getting bigger. “Even today, after the crisis, the five largest financial institutions control 20% more assets than before the crisis,” Hoenig said. With the mergers caused by the financial crisis, concentration in U.S. banking has grown to around 60% of GDP. Before that next crisis arrives, Hoenig suggested, big U.S. banks should be broken into more manageable pieces – especially, separating commercial banking with its publicly provided safety net from those riskier investment activities in the capital markets. 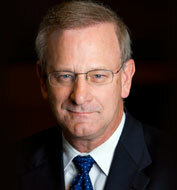 Hoenig laid out more specifics in a speech last month in Philadelphia. I agree. Let’s dismantle too-big-to-fail before it fails us, again. Propping up banks that are “too big to fail” with taxpayers’ capital doesn’t improve the US financial system or benefit bank customers – it just concentrates more power in the hands of a few giant institutions – Tom Hoenig, president of the Federal Reserve Bank of Kansas City, argues in this week’s Barron’s. Noting that the 20 largest US banks already own 70% of the banking system’s assets, Hoenig says combining failing banks into bigger institutions only increases that concentration – in turn, further concentrating risk in a few megabanks. Congress might consider whether the centralization of banking is a good thing as it takes up regulatory reform this fall. At this point, President Obama’s regulatory proposal seems to accept the “TBTF” mantra that has governed US policy so far – proposing to deal with the concentration of risk in megabanks by incrementally increasing their capital requirements, then taking them over after they fail. Hoenig warns of “an oligarchy of interest” linking megabanks and the Washington power powers-that-be who use government policy to sustain them. Instead, Hoenig advocates more market discipline, decentralization and competition. Now there’s a radical idea for reform. But will it play in Washington? My one contribution to the 2008 financial bailout was an idea back in September to motivate members of Congress, Treasury bosses and Fed honchos to fix the markets by paying them in mortgage-backed securities. If the bailouts fizzle, the compensation is worthless. If the economic fix works, the power brokers are in the money. ZURICH — Credit Suisse Group said Thursday it will use up to $5 billion of its own illiquid assets such as mortgage securities to pay senior staff year-end bonuses at its investment bank, a move meant to spread risk more evenly between the bank and its employees. The Zurich-based bank plans to pool commercial mortgage-backed securities and leveraged loans it can’t sell because demand has seized up, then dole out units in the entity to managing directors and directors as part of this year’s pay, according to a memo made available by a spokesman. I don’t imagine investment bankers accustomed to stacks of cash will be celebrating this New Year’s over the new-fangled paper scrip. But maybe financial innovators, suitably motivated, can figure out how to get the markets unstuck. And toxic compensation may be better accepted on Main Street than the cash still being paid to some executives on Wall Street. One of the saddest news stories of the financial crisis, “Loyalty Pays a Bitter Dividend,” appears today in The Wall Street Journal – a reminder that a public company is a stewardship, a relationship in which the owners entrust assets to a management team for safekeeping, profitable use and growth. The piece leads off with a widow in her 70s who owned stock in a Mississippi bank for many years. Through a series of mergers, that stake morphed into shares in the mighty Wachovia Corp. Owning stock in a “local” bank remained a point of pride, and the dividends made a very substantial contribution to this widow’s livelihood. Until 2008. The faith of long-term holders is now being punished. … Few investors realized the danger that accompanied banking’s heady growth. Once-stodgy institutions were dabbling in exotic new securities based on high-risk mortgages, leaving them exposed when the housing bubble collapsed. The crisis says something to all executives: Our core mission is to be faithful stewards, actively serving those long-term shareholders. To investor relations professionals, this argues that companies should proactively analyze and clearly disclose risks – and changes in risk. The latest e-mail newsletter from Tim Quast of ModernIR Trading Intelligence, which tracks the flow of shares through the increasingly complex channels of the equity market and seeks to help public companies and their IROs understand these movements, comments on the impact of Lehman Brothers’ implosion on the rest of us. Quast notes that ModernIR’s tracking showed heightened activity by the Lehman proprietary trading desk in the weeks leading up to the collapse – possibly unloading equity positions to raise cash. He guesses that the impact of selling off Lehman’s equity positions in a bankruptcy may be “nominal,” less than 5% of equity values, except where Lehman holds concentrated positions in particular companies. This is no small demise, folks, and to think we won’t feel ripples for months is naïve, seems to me. Hedge funds are now without a major source of liquidity, financing and support services. Risk managers are without a major counterparty. This will absolutely discount equity prices by 10% at least we think, because higher risk and less access to capital means lower stock prices. The good news is that at last the government stayed out, and we can finally rinse ourselves of financial cholesterol and get healthy again. But it’ll take two years to sort the mess out. Quast also suggests that, with bulge-bracket firms not bulging nearly so much, IROs should cultivate retail investors and smaller broker-dealers. We’ll let the forensic professionals conduct the autopsy on Lehman Brothers Holdings following its bankruptcy filing. Over the next few days, we expect to read some extraordinary reporting in our favorite newspapers. Seriously: Those Page One “anatomy of a failure” stories will highlight some important lessons learned and offer keen observations on management and relations with the capital markets. The financial CSIs will probe the multiple injuries that led to the investment bank’s demise – and no doubt they will point the finger of blame, perhaps spreading ample amounts among the likely culprits. This is not so pleasant to read, but it can be instructive, especially in a time of ongoing crisis. Politicians, too, will visit the morgue. We’ll probably see some candidates going through the pockets of the corpse in search of election-year gain. For us, it’s a sad day. We know of 694,401,926 losers – actually, a smaller number of owners of those outstanding shares of Lehman common stock – plus, of course, many other stakeholders including the employees. The coming days will show us whether investors generally, including those of the companies for which we as investor relations people toil, also suffer deep or long-term losses. Good luck to all. Last weekend was a bit scary for the financial sector, even with the market firming up in recent days. After all, takeovers and bailouts are a sign both that decision makers are concerned and that they see compelling reasons to be concerned. So the rescues feed the fear. The process continues until there is some real event that means returns on the assets will be low in the future. Another possibility is that the central bank is forced to restrict credit because of fears of ‘overheating’ and inflation. The result of one or both of these events is that the prices of real estate and stocks collapse. A banking crisis results because assets valued at ‘bubble’ prices were used as collateral. The authors document, with empirical and theoretical insights, that what looks like collapse invariably evolves into recovery and renewal. Excesses are corrected as people learn their lessons, for a time. Allen and Gale warn that the costs to society of trying to regulate or legislate crises (or bubbles) out of existence can be greater than the short-term pain caused by those same market gyrations. What do these patterns, or our place in the cycle, mean for investor communications? I’d love to hear your comments, and I plan to post some ideas soon on practicing IR in a negative market environment. No, not that market – I mean the market for our products or services. Some time back I was writing an annual report for a bank, so I called up a few analysts and institutions who followed the stock. “What would you like to see in this year’s report?” Their answer was succinct: Tell us about the markets where the bank does business. We’re in New York or Boston and don’t spend much time out in flyover country. Are your customers hourly workers or entrepreneurs, farmers or retirees? How fast is the population growing? Does it look like new suburbia or old urban core? What about median income, business formation, competition? Can we see a map? The market for goods and services is the economic engine that drives future results, so describing and quantifying that dynamo is of great interest to long-term investors in our companies. Too often, though, investor presentations and earnings announcements ignore the real-world economic interactions and focus only on reporting the latest numbers. Numbers are critical, but this emphasis feeds the short-term interests that CEOs, CFOs and IROs so often decry. One way to speak to long-term investors is to put the company’s market front and center in the investor presentation, MD&A introductory disclosure urged by the SEC, website, conference call and so on. We can’t do anything about the stock market, anyway, but we can focus on our markets.